The kingdom has seen better times and a quest to find the Holy Grail is placed upon the young men, as this is a pantomime thing will surely not go their way. The young Arthur is joined by other squires less able than himself and it is here that we see the true abilities of his "hmmm" equals?????? Well Simmer and Boil are most definitely equal, if you add them together. 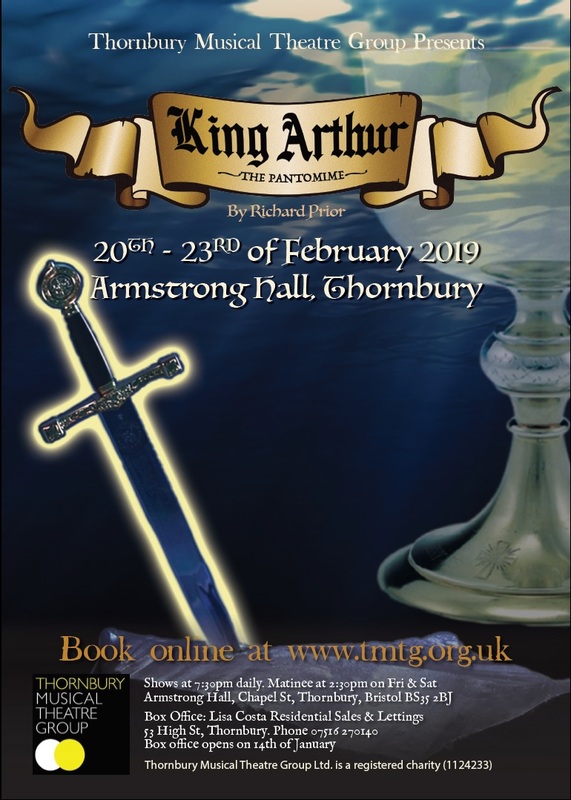 Arthurs quest truly starts when he happens to come across The Lady of the Lake (Nimue) his journey takes twists and turns, having to battle all manner of foe..
Come along and see if Arthur is to succeed in his quest for the grail and for Guinevere. We loved your pantomime this afternoon! Completely captured my 5 and 8 year old. The evil queen was amazing, such brilliant singing! Thank you for making such an affordable and entertaining production. Looking forward to next year! Fantastic show once again TMTG. Well done to all involved! Extra special shout out to my very talented brother Richard who wrote it and my shinning star niece Leia in her debut show! Went to see King Arthur on opening night. A brilliant show with lots of fun . The whole team were amazing. Highly recommend getting your tickets! Loved last night's show....my youngest is coming to watch the Saturday matinee and enjoyed the arty page in the programme - her patriotic shield!